the real mushroom plant was underground. What a change in the weather this morning from yesterday, it was glorious weather and as some of you know I spent most of it in the garden. The roses are all blooming and the scent in the air is really beautiful and shouts Summer is here! I set out all my things on our table and then made a coffee, this was 9 in the morning and it was already hot. The day stretched before me and I could not wait. 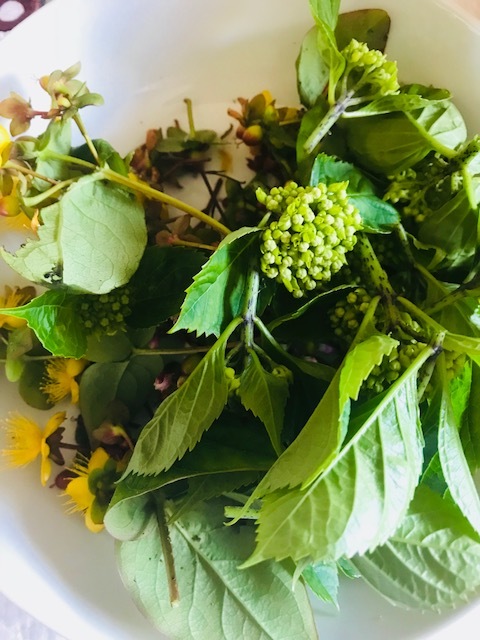 Sitting there in the garden sipping my warm drink and watching the wildlife go about their busy day I decided to pick some flowers for drying so with my hazmat suit on, off I went and picked some gorgeous bits to use later on when they have had time to dry happily. I am very pleased with how the little buds of hydrangeas turn out also another beauty is the Hypericum also known as 'mystical red star' and has lovely yellow flowers on it that turn to red berries and is often found in flower bouquets. I found my book that press them in and took out the last lot that is now in the little box I keep them in and started wrapping them up in kitchen roll and placing them in there but ran out of space! So now I have three books of flowers in there. When ever you buy an antique book it really is lovely to find a little something inside it. In the past I have found a letter, feathers, dried flowers and a little calling card that meant something to someone at one point. Those things stay in the books I never take them away. I have started adding something to special books as well so in future years ahead others may derive pleasure from the finds as I have. wonderful rustic and very old linen. Then I sorted the thread out and well started to stitch. Some of the quote above is on there too ( in pencil for me to stitch over) and I am well on my way to completing this within a few days I should hope. I have taken a picture of the first mushroom that is nearly finished for you to see ( first picture on here). I love mushrooms they fascinate me and when I find any on a walk in the forest I have to go and look, especially if there is a ring of them. When I was a young girl we spent lots of time in the New Forest as my Grandad had his horses on their and we would ride. I spent many a happy hour wandering around in the wooded parts and looking at plants, flowers and mushrooms and was told that the ring of mushrooms was where the fairies came to dance .... my love of them began then and I was 4 years old. Also I remember being told that there is more to a mushroom than what you see above ground. Underneath the forest floor and leaves and acorns there is a network of tiny thin roots like pieces as well called mycelium. I have tried to capture that too in thread.... you will see from the photo there are loose threads that just need a few tiny wee stitches to keep them in place and to spread them.. I am still working on the photo above and I have lots more to do on the whole picture but will have great delight in finishing this piece. However it if it is not really cold and windy but just dark I will still go sit outside for a while with a warm drink ( Cinnamon tea ) and my slow stitching for a while. If a storm does appear I will have to retreat inside and light some candles and continue on. I am loving my new 'office' outside this year and after being inside for so many months in front of a fire and stitching with the lights on it is so nice to be slow stitching in natural light for a few months. 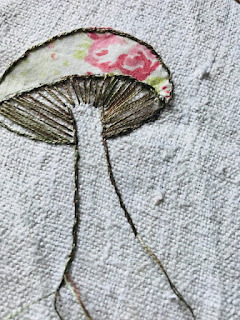 Yesterday I felt I achieved so much and in addition to this mushroom stitching piece I am working on I manged to complete two more designs that will follow from it so I had the most productive and happy day yesterday. Oooh I really love the mushroom, so pretty. I love finding things in books as well, sometimes there will be a newspaper clipping about the book itself or something relating to the subject. One day somebody will have a heyday finding all the flowers and clippings in my books. I'll have to send you a pic of a very unusual item that I found in a book , it's wrapped in some old parchment paper....a rather odd curio. Thank you I am enjoying stitching this and do not want to stop but keep going! Yes one day someone will do the same in my books! How wonderful.. the thread is hand dyed shaker .. ‘ Old covered bridge’ a delicious name I think. Finding things in books these days always reminds me of the charity bookshop in Tavistock. They have a pin board on the shop wall of all the "bookmark" things they find in books. Pressed flowers, train tickets and there was even a 10/-note, and my favourite Lego Tree, the original Lego trees were flat. People will certainly fin things in my books, from satin ribbon once used to tie my hair back as child to notes left on scraps of paper. I am glad you leave things in books and I feel they belong there personally so hope our things do not go on a notice board or indeed the bin but stay with our books for others to wonder over. I know they are flat, and there was five in the set because I had some. One was and elm and one was an oak, they were like silhouettes moulded in green plastic. Well Julie you have a great memory indeed. I do not remember .. to be honest it was not my thing when I was growing up. Play dough, art pencils and paint, papers, scissors and glue .. sparkly things and dolls with long hair to brush ... oh and books .. lots of books, always been a book worm. Sew clever and creative Sarah! What a special memory from your visits to your grandfather's. It is cool here today but then a run of weather in the 70's and mostly dry. We are getting ready to host a graduation party for our son in law when graduated with a Bachelor's degree in Physical Education. So...not much stitching. Thank you I am getting pleased how the mushroom pictures are coming along. The visit with mum was good although she was very confused today. I hate to see this cruel illness chip away at her. Oh wow! a busy time for you then with a party and you all must be hugely proud of him as well. Enjoy your party and the stitching will wait patiently for your return. Hope the weather is a lovely day for the party too.